M-Rad Studio architectural office towers suggests mixed without drawers to the center of the city of Las Vegas Archi-new - Free Dwg file Blocks Cad autocad architecture. Archi-new 3D Dwg - Free Dwg file Blocks Cad autocad architecture. 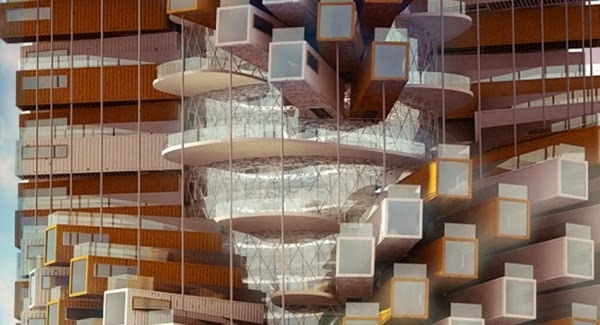 The M-Rad Studio architectural design proposal for the office tower combines different use housing and work to occupy his place in the US city of Las Vegas in Nevada center. Under the title "Interactive housing" Inter-Act Residence combines design the tower, which carries the possibility of switching to several office towers and apartments Mudiolah strategically arranged with residents to ensure interaction. Accommodate the proposed design options: the first includes a pair of towers next to each other carrying the offices and apartments where dwell moves between Monday and interact within the general vacuum between them, which will, in turn, impossible, commercial and other business. The second option is proposed towers and one with a mix of offices and apartments. However, both options will be separated so that the adequacy allow and encourage residents to navigate within the building and ensure the convergence of people and communicate socially on the way to and from work and so leased or sold, or both apartments are. The apartments come a variety of sizes for two people with an area of 865 square feet or one person at half the space. Concentrated modules apartments and offices around the RAMP annulospiral was divided by spaces large balconies provide places for meetings, and so out of architects decision to dispense with the drawers in order to ensure the "physical connections and insight Standing between those who dwell where no longer divisions (such as flooring, doors) and constraints (such as drawers) Norma architecturally. We are eager to chance. "The extent of architectural expression.